Always have your glasses on you with folding reading glasses you wear around your neck. Easy-to-use and discreet readers unfold when you need them (you can pick from various lens strengths) and collapse back when you're done. Dimensions 2.2" x 2.64" x 0.63"
I have about 4 other pairs of glasses. However, every time I needed I had to search through the house and finally I might find one pair and then take it off after reading what I needed it for. Later, guess what, I couldn't find them again. Love them, always know where they are. I love my folding glasses. Easy to use and look like a necklace! Very unique style, like a piece of jewelry. But very functional and useful at a good price.. I only need reading glasses, so I don't wear them constantly. Hence, I have several pair all around the house, which works when I'm at home. However, if I'm out, I have to fish in my purse when I need to read something, and these make that much more convenient. And as a necklace, they're quite attractive. When it came time for Neckglasses founder and interior designer Karen Ganovsky to need reading glasses, she wanted a better way to keep a pair handy. She thought up creating foldable readers with refined finishes that look discrete enough to wear as a low-key accessory. 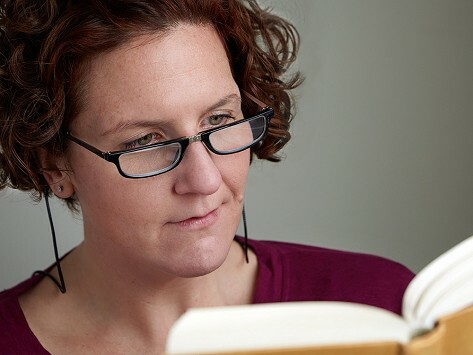 Karen and partner Dianna Seddon developed these functional readers to be lightweight and easy to access and we think they nailed it—because what is more convenient than having a pair of glasses hanging from your neck? From an armless design that has a jewelry-like finish to pairs with more streamlined and utilitarian looks, Karen’s idea means no more digging around to find your reading glasses or leaving them behind.